Beth Mormino imagines a future where a series of neuroimaging and genetic tests will be used to predict whether or not an aging individual is at risk for developing Alzheimer’s Disease. This level of understanding will open the door for medical treatments to prevent cognitive decline. Mormino became Assistant Professor of Neurology & Neurological Sciences at Stanford University in January of 2017. In her lab she combines structural and functional MRI with PET imaging and genetics to study the aging brain and Alzheimer’s Disease. She asks two questions that she describes as two sides of the same coin – What are the best predictors of Alzheimer’s Disease? And what are the predictors of resilience? Mormino received her B.S. at UCLA, where she worked in Arthur Toga’s Laboratory of Neuroimaging. 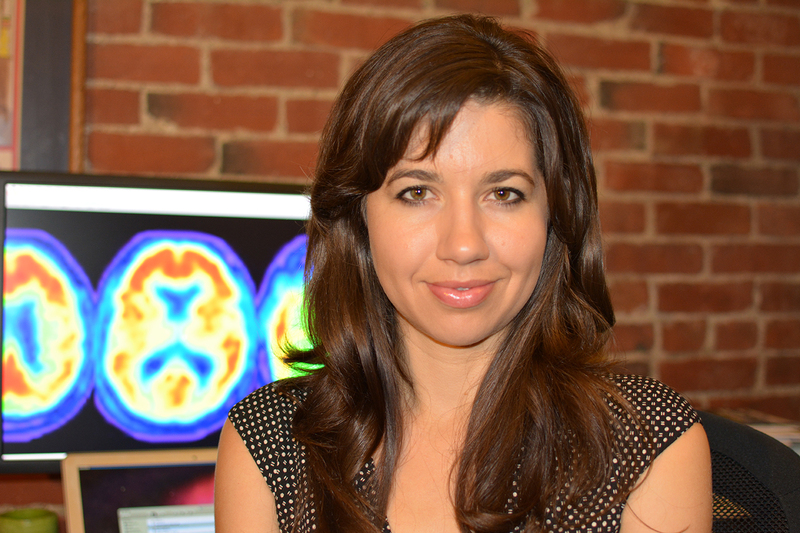 She entered the UC Berkeley Neuroscience PhD Program in 2005 and completed her thesis work in William Jagust’s lab. Next she was a Postdoc and then an Instructor with Reisa Sperling at Harvard Medical School. During this time she was named one of MIT Technology Review’s 35 Innovators Under 35. 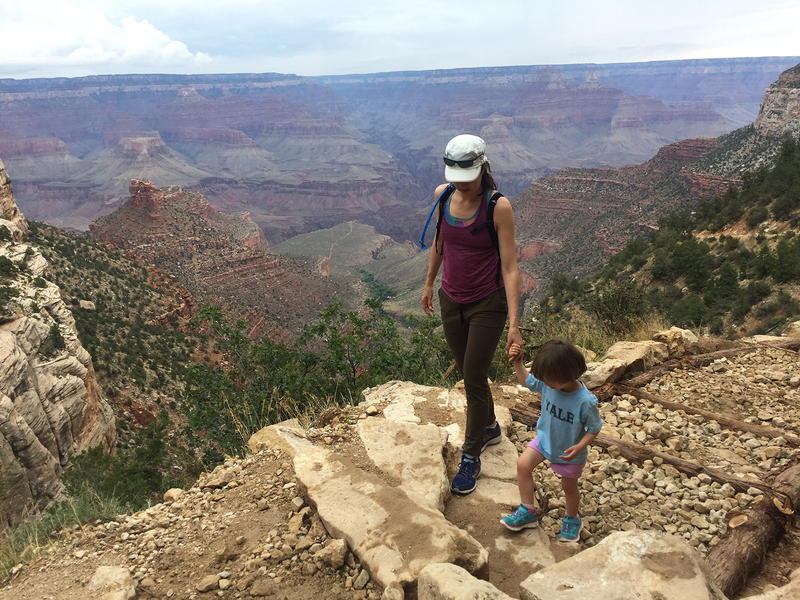 In the following Q&A, Mormino talks about her love of brain scans and her focused research trajectory toward understanding the aging brain and the genetic, molecular, and structural predictors of cognitive decline. Georgeann Sack: Tell me a bit about your background story, specifically in relation to your interest in neuroscience. What sparked your interest in neuroscience? Beth Mormino: I don’t know exactly when the moment was. I entered undergrad with the intention to go to medical school so I was always more science focused, but I didn’t have much exposure before undergrad to anything brain related. 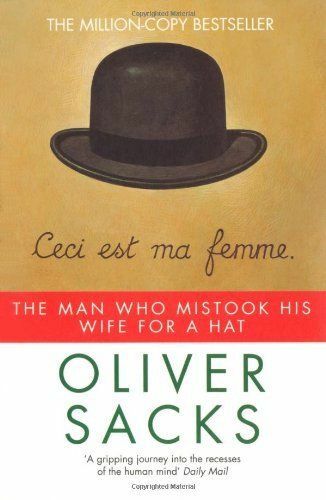 I was taking a lot of science classes and I read the book “The Man Who Mistook His Wife for a Hat” by Oliver Sacks. I remember reading that and thinking it was interesting that the brain is so complicated, but then when something goes wrong you get such bizarre behavioral outcomes. That really sucked me into it. I became fascinated in human brains, specifically in the context of different diseases. I started working in Arthur Toga’s neuroimaging lab at the very end of undergrad. My research project was focused on pediatric disorders, schizophrenia, ADHD, and epilepsy. I totally fell in love with research. That was how I pivoted from being interested in medical school and patient interaction to realizing that what I really like is the research behind different neurological and psychiatrc conditions. I thought it was so amazing to be able to actually look at a picture of a person’s brain. I still to this day think brain scans are amazing to look at and haven’t gotten sick of it. GS: Is there a certain kind of brain scan that is your favorite? BM: Yes. My favorite is a high-resolution structural scan that you can get from an MRI. I can look at them all day. T1 weighted images that you can collect off of an MRI scanner show very good contrast between the white and grey matter. You can see the cortical ribbon really nicely, and you can see all the gyri and sulci. It is just a very beautiful image of anatomy. And what is so remarkable is that when you look at two people’s brains, the big picture is very similar, but when you really go through the slices, everyone’s brain has its own individual differences, like a fingerprint. GS: What led you to choose Berkeley, and the Jagust lab, for your PhD studies? BM: Berkeley was nice because there were so many clinician scientists there. Even though Berkeley doesn’t have a med school, there are a number of research labs at Berkeley that have a clinical focus. At the time, that was Bill Jagust, Mark D’Esposito, and Bob Knight, who all had these medium to big labs that were focused on human imaging data. I really liked the idea of lab work that had clear translational qualities but were completely focused on the research aspect of it. I didn’t know that I was going to join Bill’s lab, but he was my first rotation and I totally fell in love with his group and the research he was doing. It was very much aligned with my main interest of using neuroimaging to understand behavioral consequences in humans. Figure 1 from “Episodic memory loss is related to hippocampal-mediated β-amyloid deposition in elderly subjects,” published in Brain (2009). Brain scans from 6 subjects are shown. Subjects A-C have Alzheimer’s Disease, while D-F are cognitively normal. 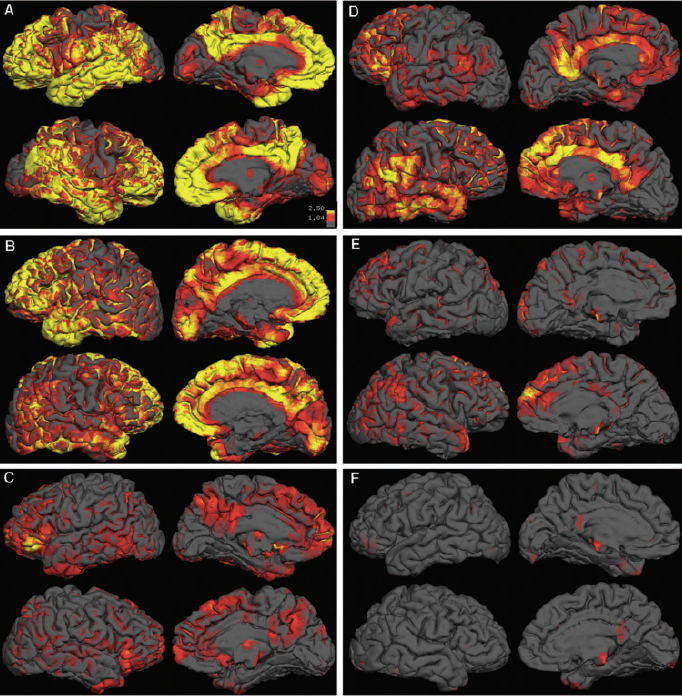 PIB-PET scans of β-amyloid protein are overlaid on T1 weighted MRI scans of brain anatomy. Click image to go to article. GS: Did you have a good experience in the Berkeley Neuroscience PhD Program? BM: Yes, it was great. It is a very open and collaborative program, and there are so many labs doing exciting things. I always felt like I was surrounded by super smart capable people that were asking interesting questions. GS: What would you say was the central question you had when you started your PhD studies in the Jagust lab? BM: Among people who have no clinical symptoms of Alzheimer’s Disease, are there early changes happening that we can detect with neuroimaging, and what does that tell us about brain health and aging? Somewhat related to early detection, but at the time we didn’t really understand what early detection for Alzheimer’s Disease would be. GS: Has that question changed over the course of your career? BM: I have stayed pretty consistent in my career in that I have continued to be focused on neuroimaging and aging and how this intersects with early Alzheimer’s Disease. There have been tremendous changes in technology that happened over the last ten years. Amyloid is a protein aggregate thought to be important for Alzheimer’s Disease. Before 2004 the only way to measure it was during autopsies, which is not very helpful for patients. In 2004 a PET scan came out that allowed us to measure amyloid in the living brain. And that was essentially right when I started my PhD work. So I was using this scan that allowed me to look at amyloid, and to understand what that meant very early on. Interestingly, when you study people who have no clinical symptoms whatsoever, normal older people in their 70s, about 30% of them will have high levels of amyloid in their brains. So that was the main question of my dissertation. There are people who seem to have this pathology in their brain without symptoms, so what is going on with that? Do they show network disruption in brain regions involved in memory, given that memory is one of the earliest deficits of Alzheimer’s Disease? We really didn’t know what having Amyloid without clinical symptoms meant. Fast forward 10 years later, these amyloid scans are widely used in the research community and in some clinical applications. The most exciting thing is that there are prevention trials that have been launched in the last two or three years that actually will scan normal people for amyloid and then enroll them in clinical trials where they are treated with an anti-amyloid therapy to understand if we intervene early, will that be a successful strategy against the disease. It really shows an interesting trajectory of the use of these research scans that have translated to potential therapeutic implications. GS: What age range do you test? What is the youngest age you have seen amyloid accumulating in cognitively normal individuals? BM: It is really uncommon to see abnormal amyloid before age 60. In the 60s it is observed in about 10-15% of people, then jumps to about 30% in the 70s, and a little higher in the 80s. Mormino hiking with her daughter, Ada. GS: Do you feel like the field is at a stage where you could make recommendations for diagnosis or treatment to medical doctors, or is it not quite there yet? BM: Definitely not for treatment, because there really is nothing in terms of treatment that actually affects the disease itself. The only thing that has really come up consistently as being beneficial, and not just with Alzheimer’s Disease but many age related diseases, is exercise. Even though Alzheimer’s Disease is so common and we have these different markers that we are able to use in humans to try to measure the disease, it is incredibly difficult to predict who is actually going to get the clinical symptoms of dementia. For diagnosis, amyloid PET scans are approved by the FDA now to help aid the diagnosis of somebody with clinical symptoms, but insurance companies have decided not to cover them because there aren’t any treatment options. So we are in a bit of a weird zone right now. The scans are being used in screening for clinical trials, as mentioned earlier, to find older normal people with evidence of Amyloid. So for both diagnosis and treatment, we are really at a research stage, and I think that will be borne out in clinical trials that are testing treatments directly. GS: You have been investigating other biomarkers markers for cognitive decline. How is that going? BM: Amyloid is just one marker that tells us about the amyloid plaques, but there are a number of other important features both with respect to Alzheimer’s and human aging. My work has tried to connect the amyloid piece with these other markers that fall in the category of neuronal integrity or neurodegeneration. I have done a lot of work looking at hippocampus atrophy or different patterns of hypo-metabolism. It tends to be the case that among asymptomatic older people, amyloid by itself is not enough to predict cognitive decline. It is amyloid plus subtle signs of neurodegeneration, which you can detect with other scans like MRI scanning and FDG-PET, which is a measure of glucose metabolism. Over the last few years I have looked a lot at longitudinal decline now that we have these datasets of people who have these biomarkers and we follow them for years. It seems to be the case that people who are abnormal on amyloid but also on other markers seem to show the greatest decline. GS: You are also studying what makes some people more resilient to cognitive decline. Can you explain? BM: It is two sides of the same coin. You have these people that have abnormal amyloid. One question is what does this tell us about early disease, but then the other question is are there protective factors that allow these people to have pathological amyloid burden without showing cognitive decline? I don’t have publications on it, but my recent grant is focused on genetic factors. I personally think there will be genetic factors that modify your risk and might explain why there are so many individual differences in the response to amyloid. GS: What are the central questions you are asking in your own lab? BM: I am focused on predictors of cognitive decline. There are new advancements in PET with the ability to measure tau – tau is the other protein aggregate that occurs in Alzheimer’s Disease – so we are just starting some new studies with brand new tau imaging ligands that should be promising for understanding early Alzheimer’s Disease and prediction of decline. Another direction is markers of neuroinflammation. Neuroinflammation is a process that is important for human aging and Alzheimer’s Disease, but we haven’t had a good marker to study it. We are going to be starting some studies with ligands that are measuring microglial activation, which is thought to be an important predictor of Alzheimer’s disease. So a lot of my lab is focused on the integration of these new ligands to help us understand early changes in aging. I am also interested, as I mentioned, in genetics. Alzheimer’s Disease is somewhat heritable, but we don’t have a good sense of what the genetic architecture of Alzheimer’s Disease is. I have some studies lined up to look at genetic predictors of decline in older people that have biomarker evidence of Alzheimer’s Disease but are cognitively normal. This is important for understanding genetic risk of Alzheimer’s Disease, but also for potential screening tools and being able to estimate risk for individuals. You can imagine a scenario where if we had all this data collected on a normal older person, you could feed it into an algorithm to really understand their individual risk of decline. We are far from that right now and I think genetics is going to play a large role. GS: What publication are you most proud of? BM: Probably my first – 2009 in Brain. Maybe because it was my first, and it was a nice study in that it was the first time we were looking at a lot of these imaging modalities that ended up becoming very important. So it feels like it was a landmark for both me personally and also for the field as well, since it ended up becoming something that was integrated so widely. GS: What do you like to do outside of work? BM: My husband Charles Cadieu was in the neuroscience program. That is how we met. We were in the same class at Berkeley. We have a three year old daughter, Ada, and that has been a lot of fun. I am obsessed with exercise. I run a bunch. That helps a lot with being productive and staying healthy. I also really enjoy being outdoors and bird watching. That is an ideal escape for me, going on a long hike and trying to find a specific species of bird. 35 Innovators Under 35: Elizabeth Mormino, “A telltale protein seen in people’s brains before they have Alzheimer’s could offer a clue about possible treatments,” by Anna Nowogrodzki, MIT Technology Review.